Elizabeth Symington shares her art secrets, trials and triumphs as a visual artist, along with her motorcycle adventures. When I got laid-off I was thrilled. That meant I could finally take the road trip I’ve wanted to go on for years. 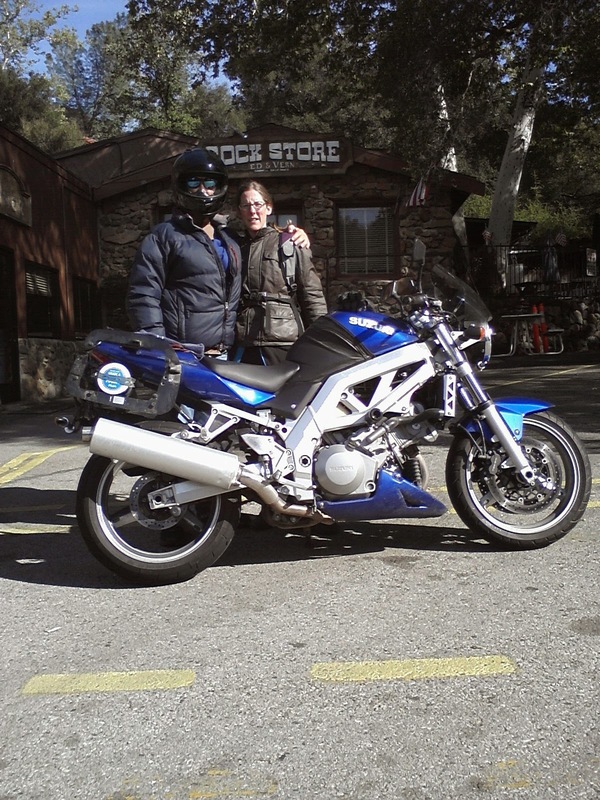 The plan was to explore California on my Suzuki SV1000. I wanted to avoid rain and snow, so I headed south from the San Francisco bay area. Other than head south I didn’t plan where I’d sleep every night or what I’d do. I wanted to have an adventure and that is exactly what happened. Ever since I was little I have wanted to be a nomad, a monk and an artist. 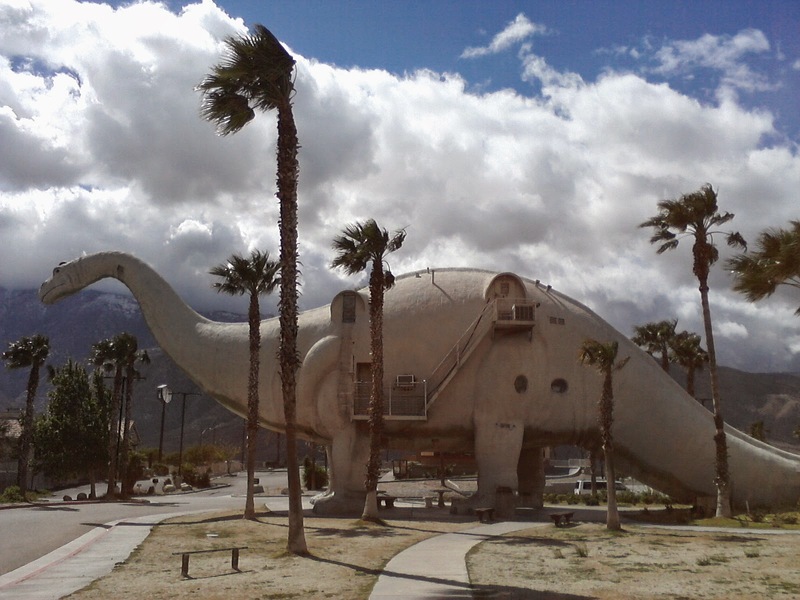 This road trip encompassed all of that, in addition to being a rite of passage. I intentionally faced my fears, because the fun that was yet to be had was taunting me. 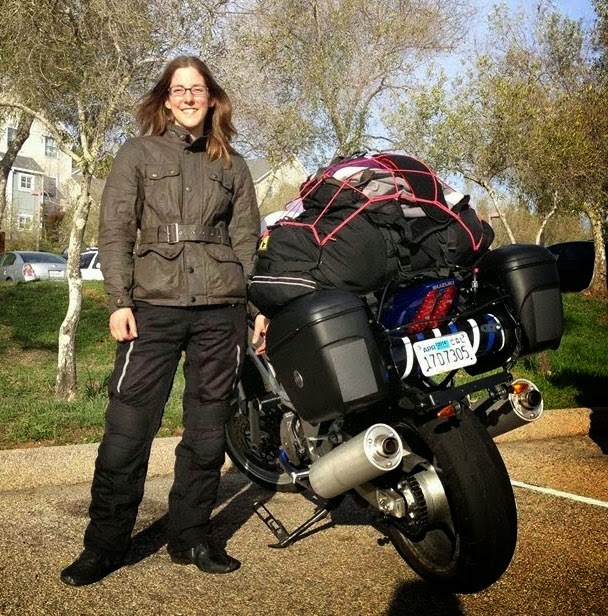 Traveling solo on a motorcycle was a scary first for me, but has since consumed my mind. All I want to do is ride! I don’t need a man to protect me. 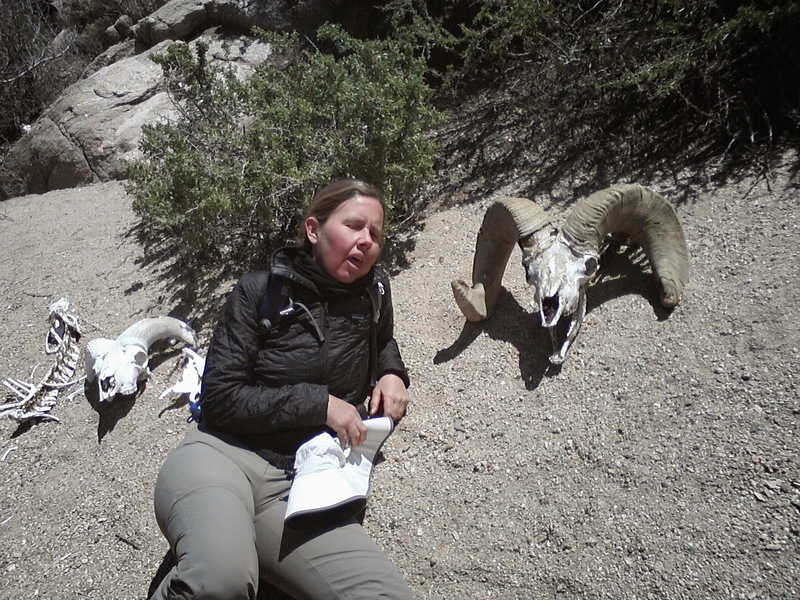 As was camping solo in the middle of nowhere, no wild animals attacked me, so I can write-off that fear as well, which gives me more options when I travel. 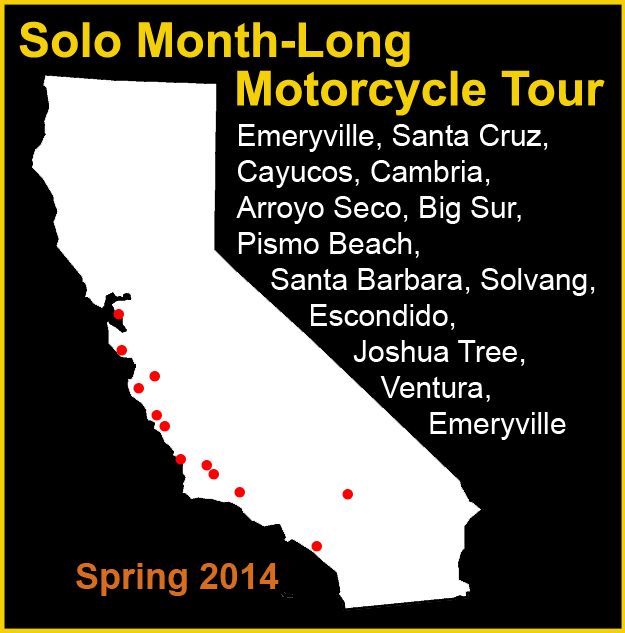 During the 28 day long road trip I rode 2,683 miles around California. As you’ll see from the above picture, I explored California, cruised down Highway 1, where I fell in love with Big Sur and all of the beautiful wildlife, where I saw a whale, a bobcat and a condor! Like a true biker my priority was to ride the most scenic and beautifully paved roads over finding the most efficient route. Plus I didn’t need to be anywhere. That’s the joy of not having an itinerary. The adventure was in the riding and discovering whatever came across my path. Basically I continued down Highway 1, spent a few days at a Buddhist monastery in Escondido, camped in Joshua Tree where I discovered my love for the desert and back tracked up north to the bay area. I stayed in hostels, a monastery, and a few nights at motels. 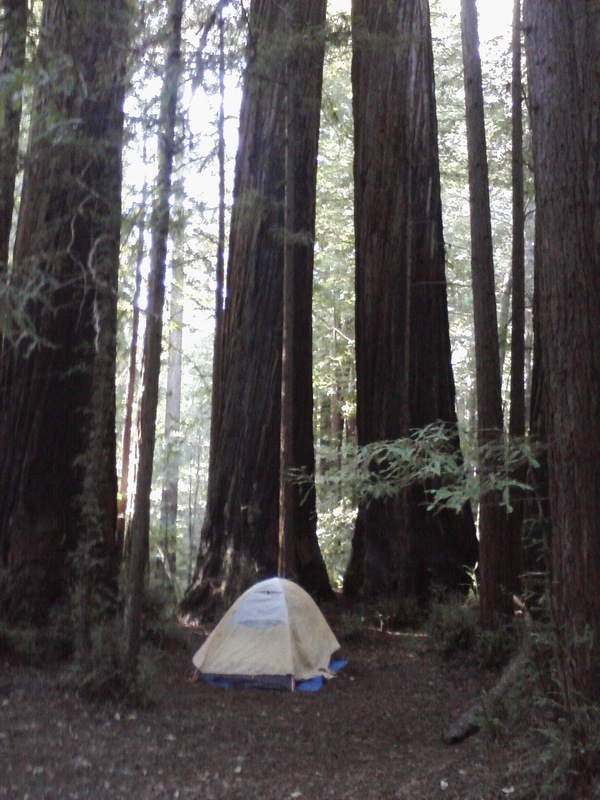 I camped in the redwoods and in the desert and I was a guest at friends-of-friends houses and at several communes. I was introduced to so many different walks of life. Constantly I was touched by people’s generosity and love. I expected this solo trip to be lonely, it was quite the opposite. Each time I left a city or town, I didn’t want to go and say goodbye to such wonderful people. My riding has improved drastically. I rode within my skill level, but pushed myself to the next level. It was my first time with a bike fully loaded down with two saddle bags, a duffle and a backpack. The extra weight changed the way I was use to riding. Plus I had to account for the extra width when I was lane splitting. I took the bike on dirt roads and had an absolute blast! I was fortunate to have ridden in only three days of rain (a sign that we are very much in a bad drought). I’ve ridden some of the most trying conditions I’ve been in to date, which has boosted my confidence and my skill level. I was depressed when the travel money ran out and I had to go back to living in one place. I felt like I was just getting warmed up. I am made to travel. I was born to ride! I loved the cycle of staying in a town for a while, having all sorts of new experiences (which were often centered around art), and then going off into the woods to camp and debrief. This trip helped me to face and overcome my fears, putting me one step closer to being a nomadic sculptor. I’m so grateful for having supportive friends and family and for their help for getting me ready for this trip. I’m deeply touched by the generous strangers who I met on the road. And I continue to have a deep love and appreciation for the bond between bikers. You guys are a part of my family! Joe, the moto dude that I met on my third day of this road trip, met up with me around the state on his days off. I told him since how part of this trip was about me facing my fears, like traveling solo, he couldnt ride with me everyday. We camped a few nights in Big Sur, had a fun time in Solvang, and checked out Ventura. 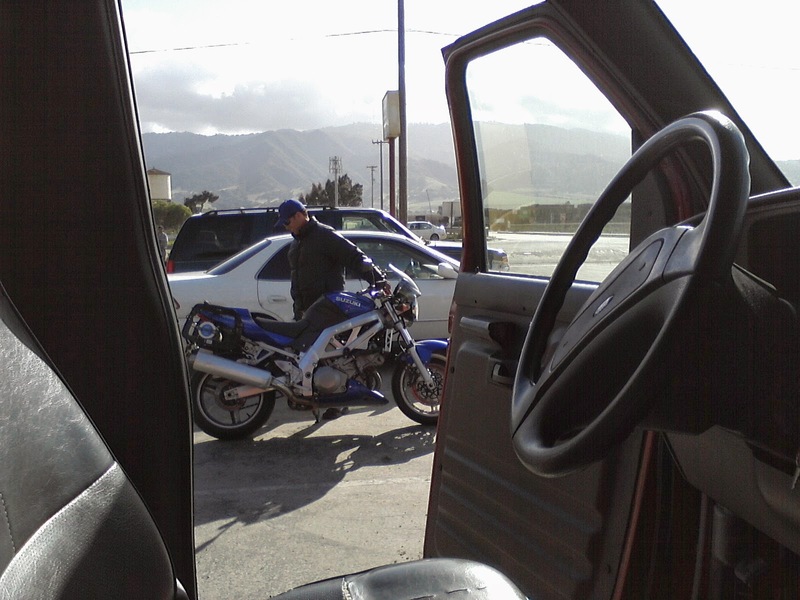 When we were in Ventura Joe drove his van there, so we rode double on my motorcycle. I figured since how he's a far more experienced rider and I only had a passenger once before, I let him drive. 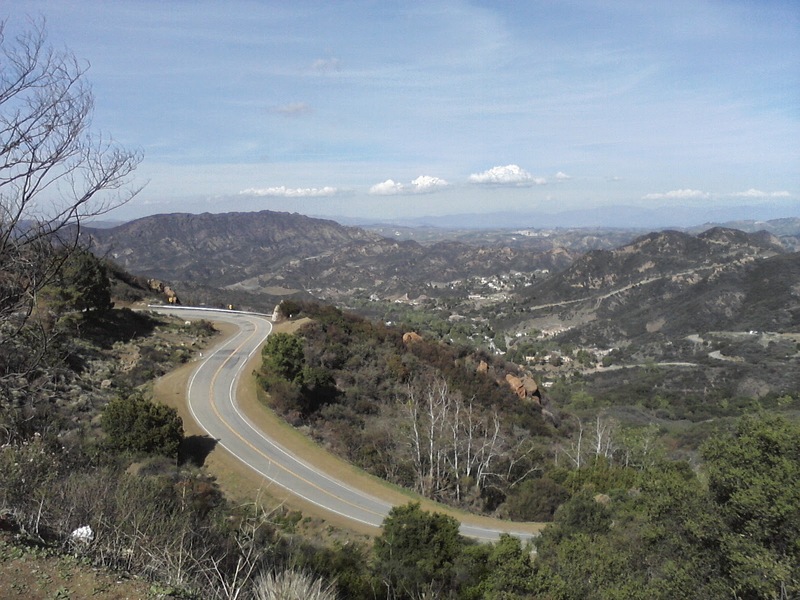 I am bummed there wasnt time to take a second run on Mullholland Highway, the motorcycle destination road, because I really wanted to ride. Next time. This was one of the most challenging days of riding because of the weather conditions. It was so frigid, there was snow in the distance, then there were high winds that made me ride super slow and in the far right lane and then there was rain. 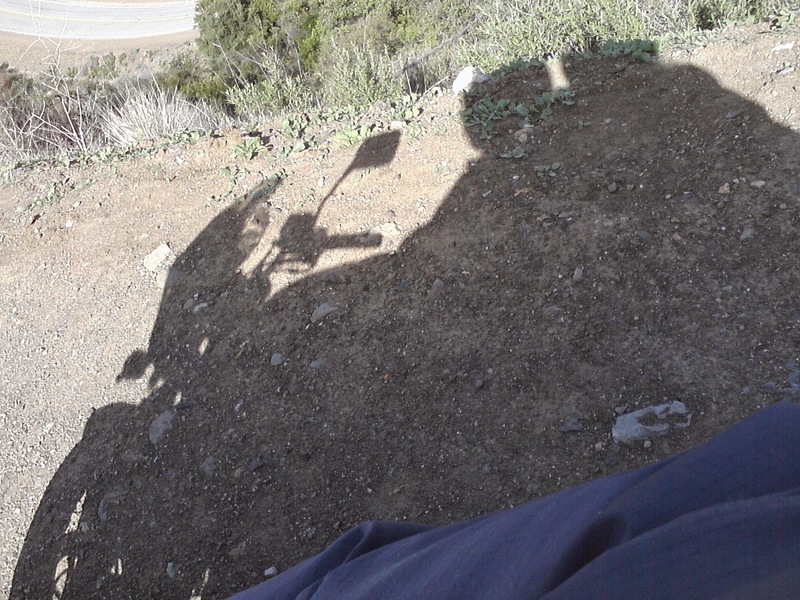 I got lost adding two hours to my ride from Joshua Tree to Ventura, making for a 10 hour day. At least the scenery was beautiful. 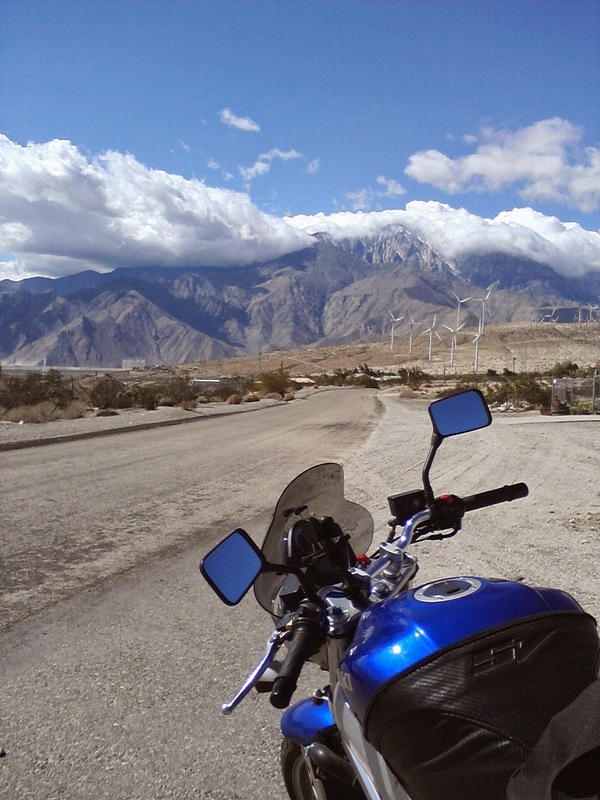 Check out these wind farms and the giant clouds on this snow capped mountain. 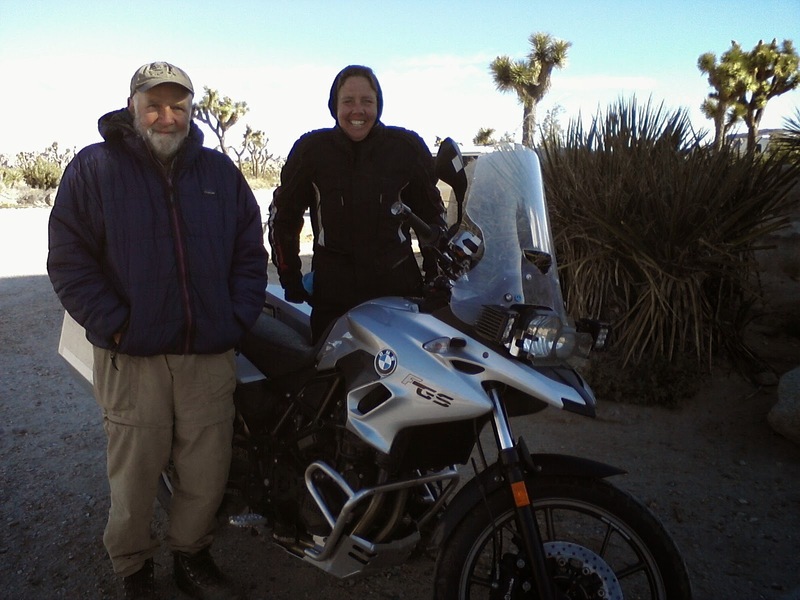 After packing up my campsite at Joshua Tree, the plan was to ride up to Sequoia National Park to meet up with Joe, except that it snowed there the night before. We talked on the phone and he suggested Ventura, since how the coastal cities would be warmer than the mountains. I looked at a map to locate Ventura (just north of Malibu) off of Highway 101 and Interstate 126. The ride to Ventura should of been a breeze, but I hit all sorts of challenging weather conditions. 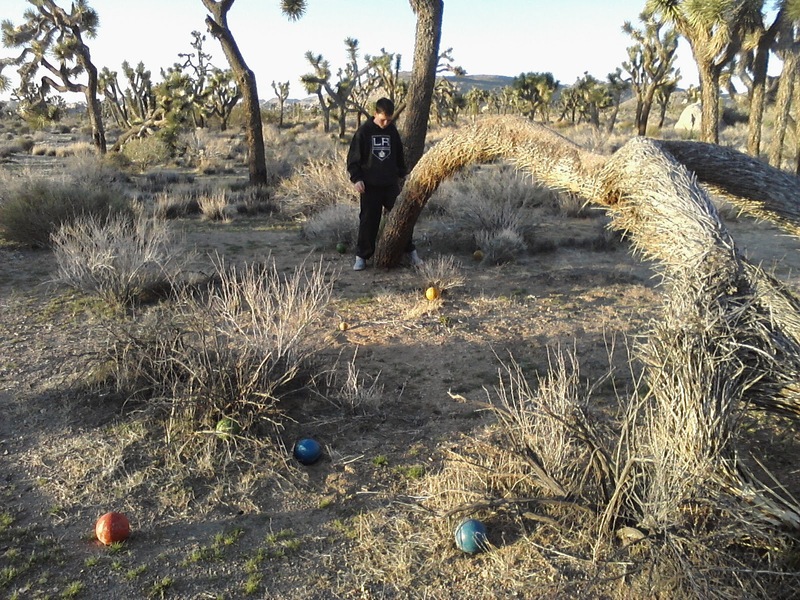 First off it had snowed within a few miles of where I camped in Joshua Tree. I feared I'd have to ride through snow or even turn around and wait for the snow to melt, but thankfully there wasnt any snow on the roads. It was majorly gusty most of the day. 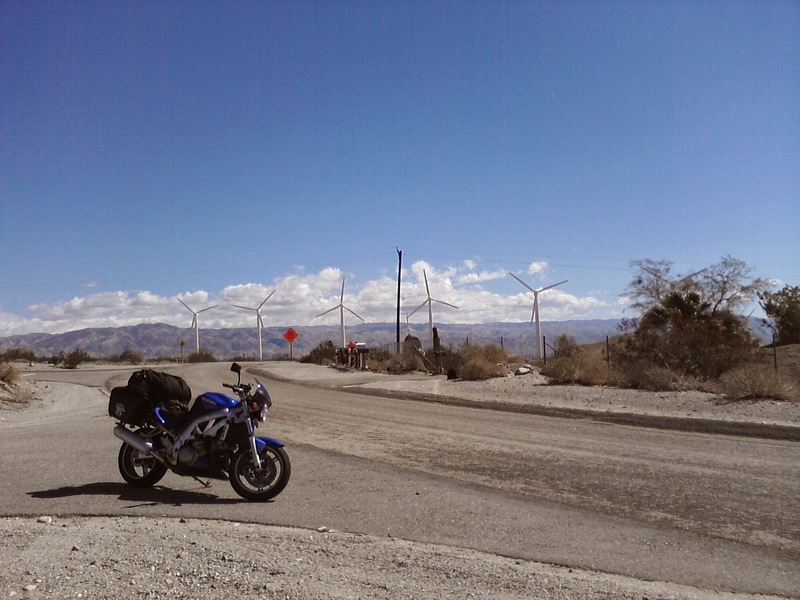 I should of figured it would be windy given I rode through a Wind Farm on Highway 10. When it was gusty I rode in the right lane, going way under the speed limit. Talk about uncharacteristic for me. When it wasnt windy it was raining. And if it wasnt raining it was freezing cold. It was a good endurance test. 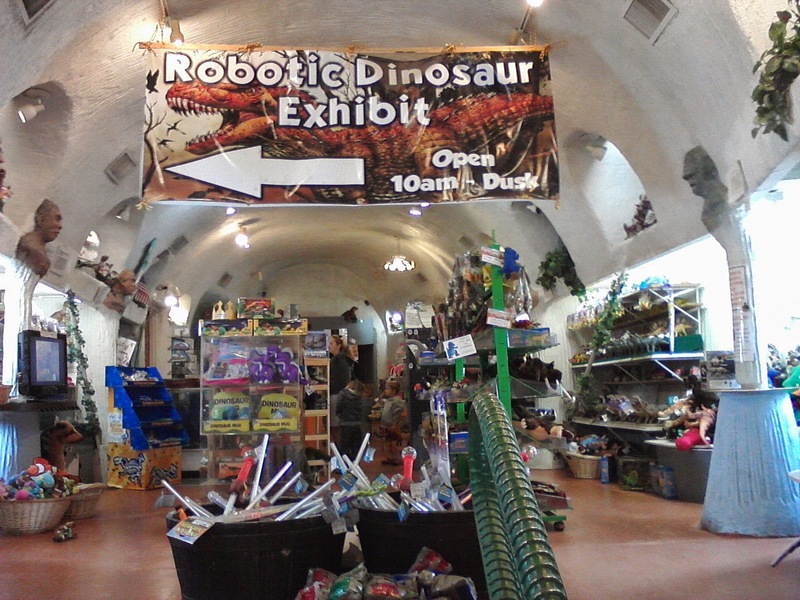 I discovered that the inside of a dinosaur is really the home to a gift shop. Navigating roads that I'm unfamiliar with by following directions that I memorized (you cant look at a paper map while riding a motorcycle) is a challenge for me. I figured this road trip would cure that and I was right. Before heading to Ventura I wrote down on the back of my hand a series of eight highways I'd have to transfer to in order to get to my destination. Every time I changed highways I'd start thinking I'd missed my next turn, but I'd hold out and then there'd be the next exit I needed. This strategy worked until the last freeway change. I ended up just South of Bakersfield before I realized I'd gone the wrong way on HWY 5, adding two hours to my trip. By this point I'd been on the road for eight hours. I turned around and went South and played the "alphabet game" to distract myself from brooding over my mistake. I had to stop at one gas station to warm my fingers. I could barely move them. 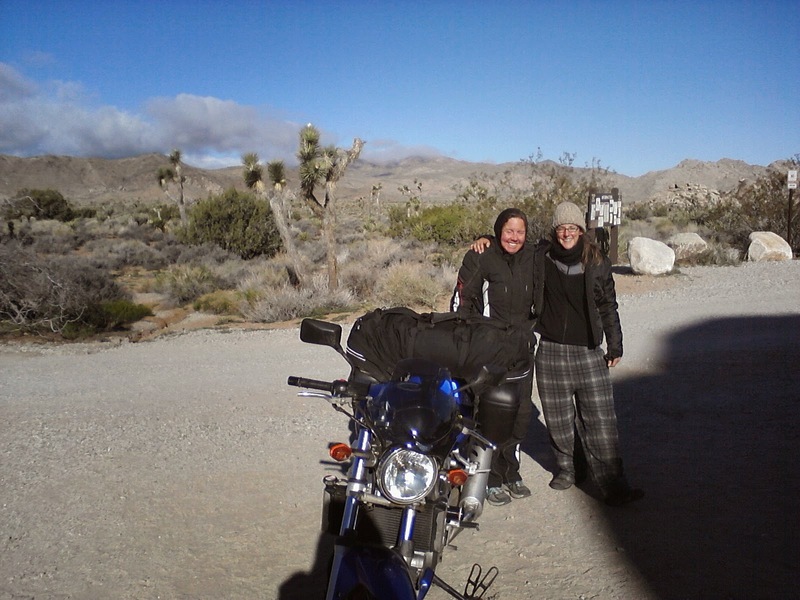 I met a biker lady, who's on a road trip with some friends from my neck of the woods to Arizona. She was super ecstatic hearing that I was three weeks into my solo motorcycle tour of California. She used to ride solo, but now rides double with her man. I was surprised that she wanted to talk to me, let alone go and introduce me to her husband and retell my story of my journey. Her and her husband were the first Harley folks that I've talked to. They're in a clan of their own, so I was honored that they'd talk to a non-Harley rider. Thank you. After four gas station stops I made it! It was well worth the 10 hour day from Joshua Tree to Ventura. I was so relieved to get off of the bike. I did a crap park job and didnt even care. Eating an authentic Thai dinner with Joe was very memorable. 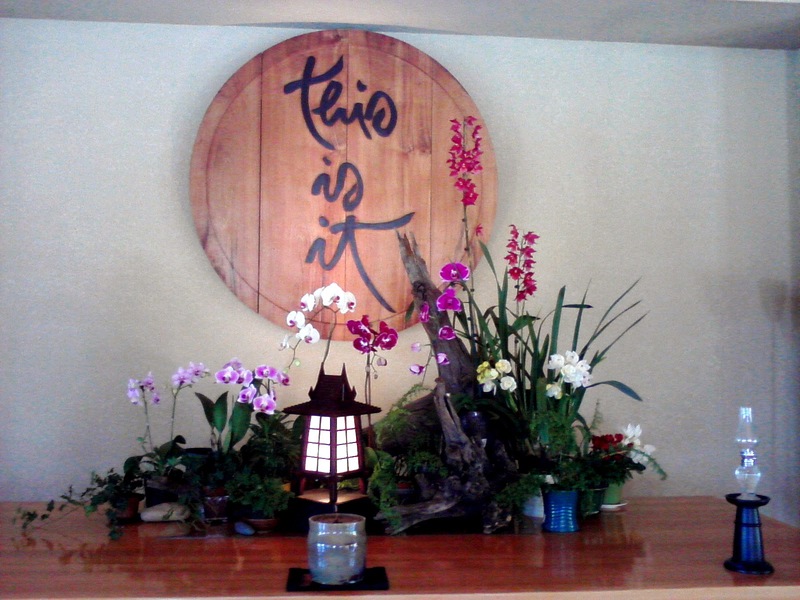 The owner of Tipps Thai Restaurant is a hoot. Ask me about it in person and I'll tell you all about it. I figured the desert is the place to either fast or do drugs. I opted for fasting. For the two days that I was there I did a juice fast. Nothing exciting (or I guess in this case, gross, happened). I figure I already eat too healthy for a dramatic, detox fast. Bummer. 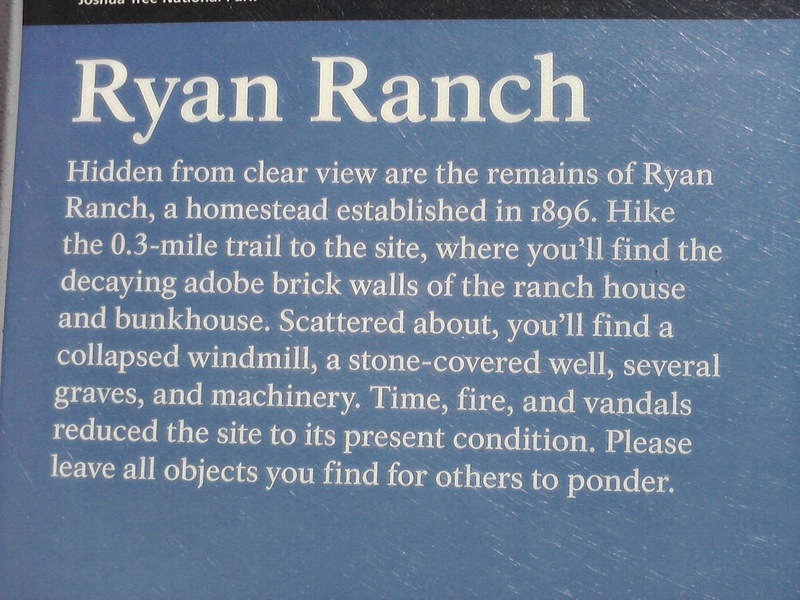 I camped at Ryan Campgrounds. When I was cruising through the campsite, looking for a spot, a lady rider flagged me down and asked if I wanted to share a camp site! Phoenix had been on the road for as long as me (3 weeks) and we hit it off instantly. You are supposed to take it easy when fasting, but I didnt want to miss out on the 10 mile hike! It was well worth it. 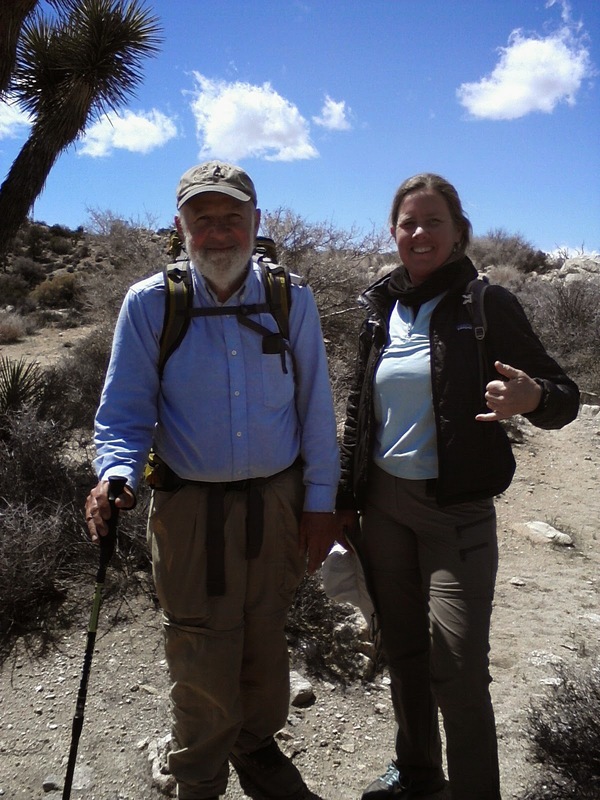 It was so much fun hiking with Bruce and Phoenix. My mantra for this trip that I say to myself every time I am hesitant is, "What would I do if I wasnt afraid?" Then if the situation was safe, I'd do whatever scared me. Doing a uturn on a dirt hill that's one lane wide. Asking a stranger if he knew my great grandpa at a trailer park. Going sea kayaking in the Pacific Ocean with a new friend. People are so much more open and friendly when on vacation. They wave to you. Stop and ask you questions. After learning that I'm traveling solo for a month on a motorcycle, the typical reaction is that I'm brave. Not really. I'm traveling in America. 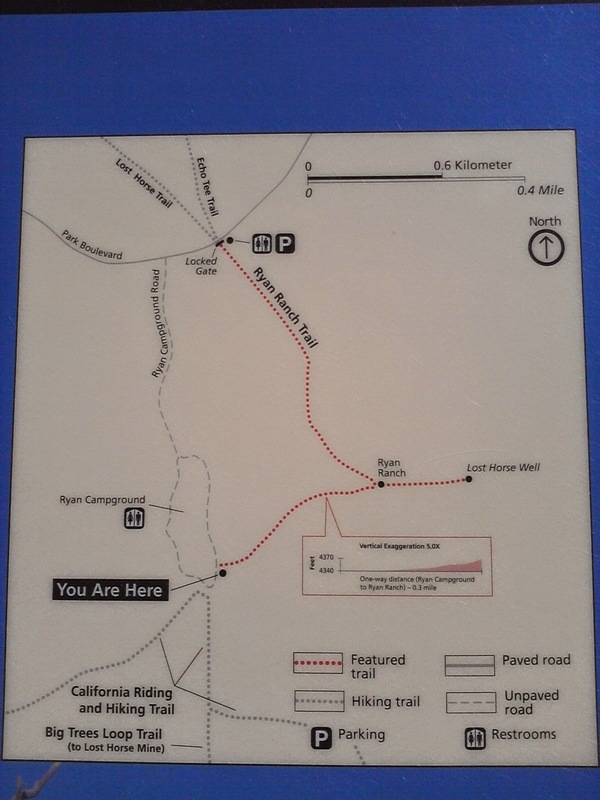 Everything is so well sign posted you cant get lost. You have to make your own adventure, which is partially why I didnt make an itinerary for this trip. I want it to be open to being as amazing as possible. If I plan it, I've then limited my experiences to a box. I'll also know everything that's going to happen to me before even departing. Meeting fellow travelers, either camping or staying at hostels, we know there isnt much time to get to know the other person, so you just dive in and ask anything and share whatever you want. Often this level of friendship takes years, but really it takes trust and honesty. I've met some really amazing people, who I hope to stay in contact for the rest of my life. 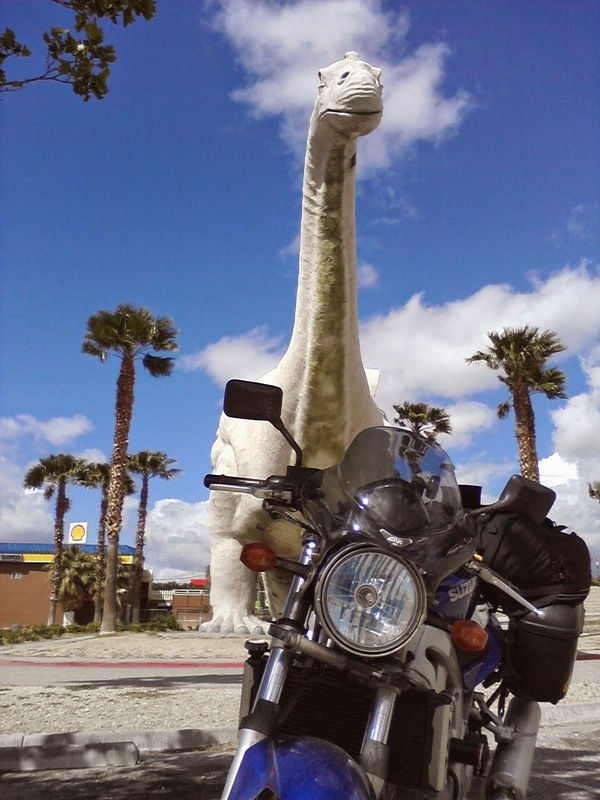 Like the Auzssie who flew over here with his motorcycle to ride from California to Chile. 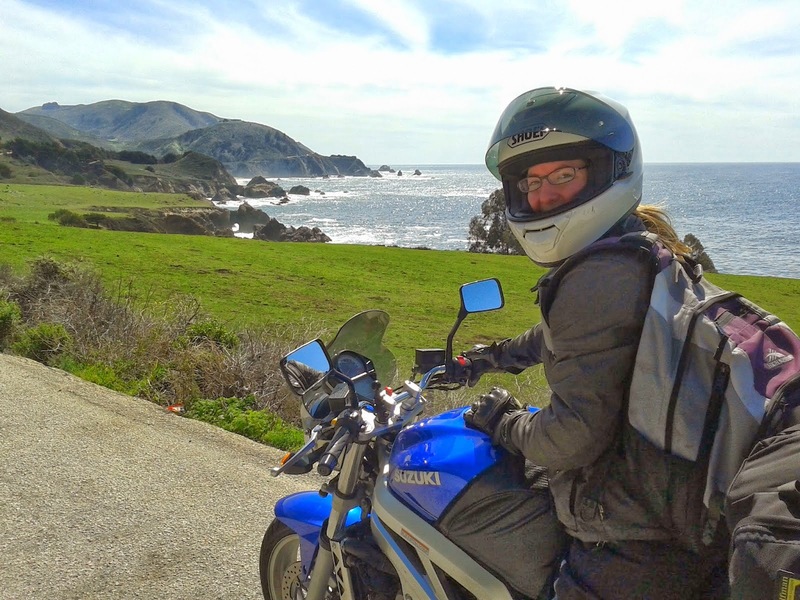 Or the lady rider from Big Sur who's also been on the road for three weeks traveling solo on her motorcycle, with the plan to keep riding as long as it's fun. Once folks hear that I'm traveling solo, I'm often invited to join them on their excursions. That's how I went sea kayaking. A fellow guest at the Cambria hostel had a car and the hostel had an extra wet suit for me. I said yes and it was as simple as that. We jumped in the car and kayaked in the Pacific ocean with Hearst Castle in the background. It was amazing! I'm glad that I'm not letting fear control my life as much. I'm also so thankful that I'm learning to trust strangers. They have blessed my life. Thank you! During the first two weeks on the road, I only saw one lady rider. She was cruising on Highway 1 in full, black leathers riding a Harley. Folks who were full gear are hot. I'd seen other lady riders, but they were "Fender Bunnies." (They rode behind their man on the bike.) 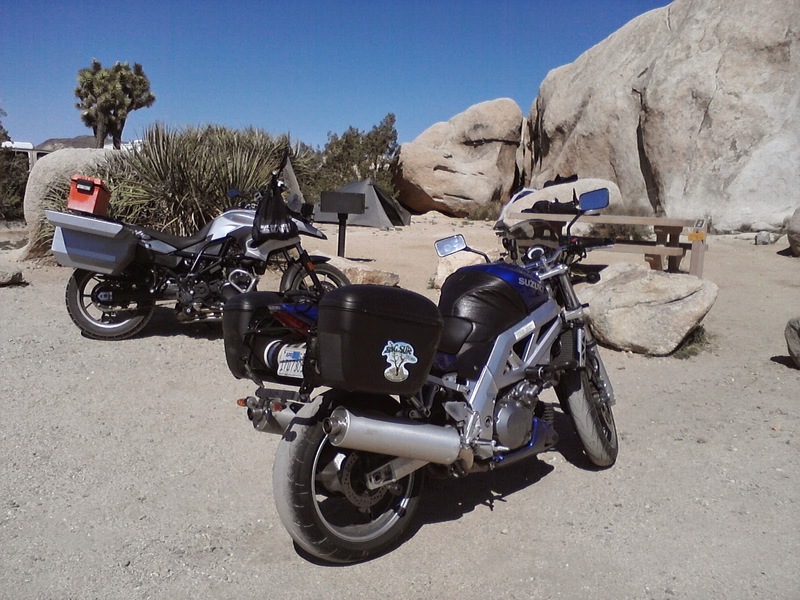 Then here in Joshua Tree I got to talk to three awesome lady riders! 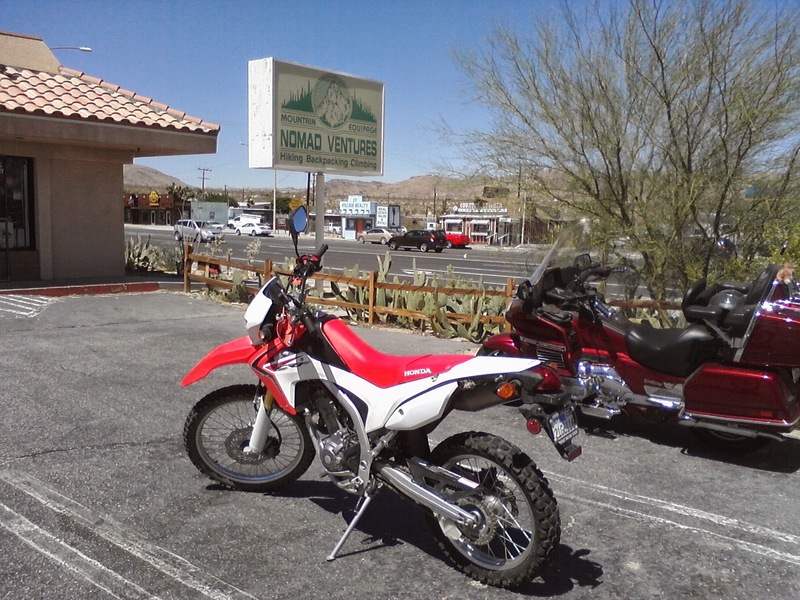 Outside of a souvenir shop in Joshua Tree, I introduced myself to a female enduro rider, who told me she just learned to ride six months ago. She was on a trip with a group of five or so friends and they'd ridden up from Guatemala and their destination was Seattle. Her bike and bags were impressive, as were her guts. She must be a really good rider to take on such a challenging trip. For me it took a year to be up for riding on a variety of terrain, at different speeds and weather conditions, learning how to maintain my bike and build up the confidence to ride, let alone do it solo. You go girl! 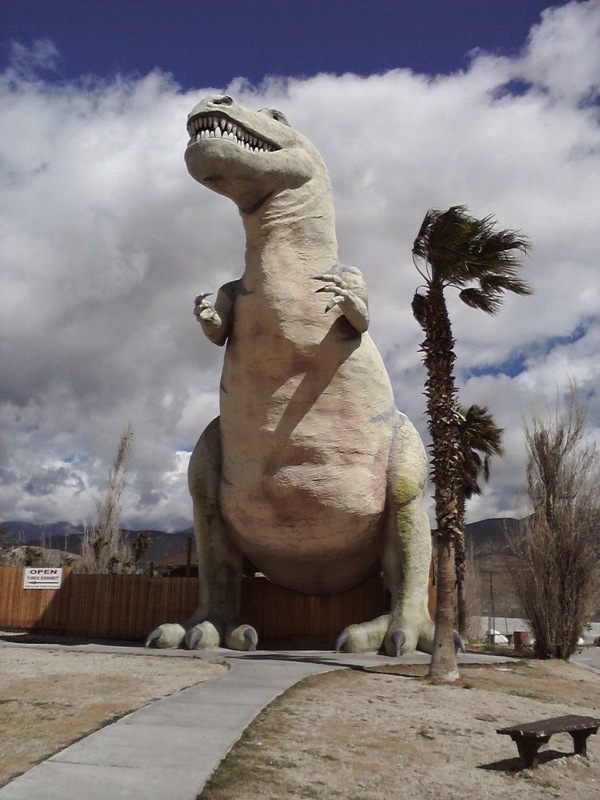 Before rolling into Joshua Tree Nation Park, I had to stop at the Nomad Ventures. 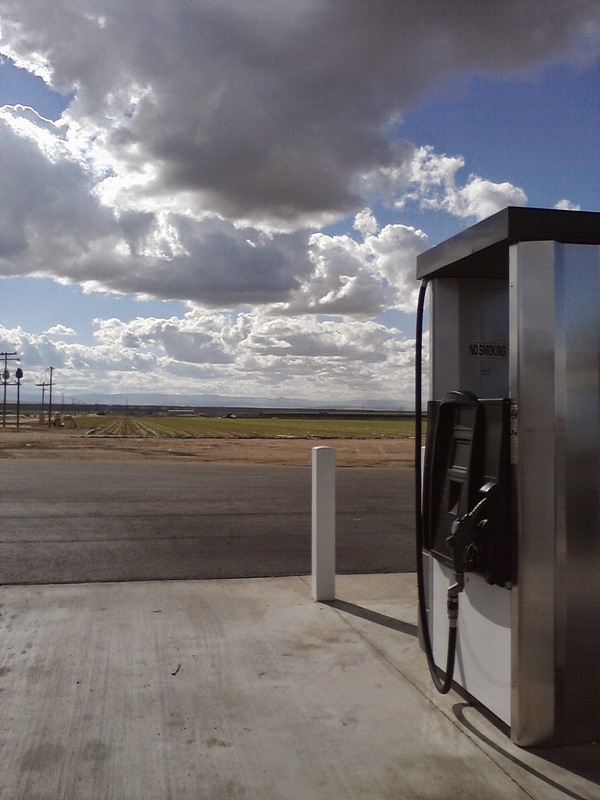 I wanted to see if they sold white gas, because I'd been out of cooking fuel since Pismo Beach. Every camping store and fellow camper that I've come across has no idea what I was talking about. Nomad Ventures had a can! I can have hot food again! Really I stopped because there were two bikes parked outside. Ends up they are the employees bikes and of course, they are super cool. Kate, the owner of the dual sport, told me that her husband proposed to her with this motorcycle. That is the best proposal idea ever!!! To my future husband, I want a bike. Not a ring. A lady rider, by the name of Phoenix, waved me down and invited me to share a campsite. She's also been on the road for three weeks, but plans to keep on riding as long as it's fun. She's been riding since she was a girl. She also lived on a boat for 15 years and has traveled extensively all over the world. Phoenix and I hit it off. We had lots of "me too" moments. Love for power tools and working with our hands. Appreciation for good, dark chocolate. Love for being nomadic. I feel so lucky to have met her. I look forward to riding with her in the future. She's so inspiring to talk to. Sharing my trials & triumphs of following my dreams of making art & riding motorcycles.